On 9th – 11th March Dan Hume and Keith Whitehead ran an induction weekend for the new members of staff who joined the team recently as a result of our recruitment process in November. New members of the team were shown the ropes of setting up camp, useful routes to our course sites, shops and hospitals, amongst being introduced to other essential knowledge required for assisting on our courses to ensure they run seamlessly for our clients. We would like to take this opportunity to welcome David Southey, Joel Toren, Mark Callard and Nigel Hopkins to the team and we hope they will enjoy their time with us. Following the induction weekend the newer members of the team were joined by the rest of the outdoor team for Woodlore’s annual training week. Everyone was pleased to be back in the woods again, and although a training exercise, training week is a fantastic chance for everyone to get together to compare their winter adventure stories and to discuss the year ahead. During the week Head of Operations Dan Hume hosted many activities for the group including a tracking evaluation, carving, training for trainers delivered by Brian Fox and PT. 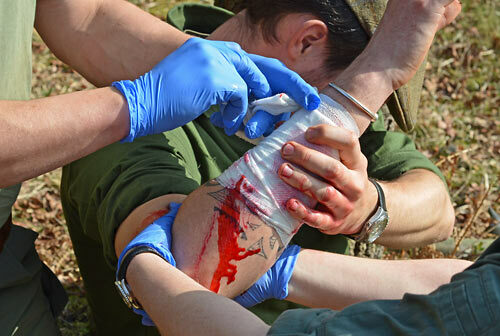 High on the agenda was Woodlore’s annual First Aid Training. 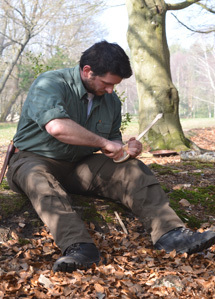 Expertly run as always by Fusion Medical Limited, it provided the Woodlore team with a high level of competence in this essential field of Bushcraft. First aid is often an underrated skill, but one which anybody who is keen to enjoy the outdoors should have. 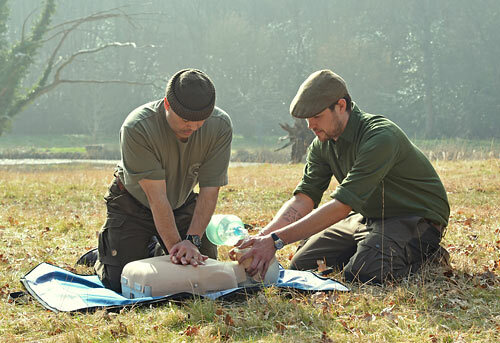 As well as refreshing the team’s essential core first aid skills, increasing the depth of their knowledge is always a goal of Woodlore’s training week. This year the team were treated to an in-depth talk on ticks by Ray Mears and lectures on venomous creatures, tropical skin diseases, altitude sickness, cold injuries and expedition medicines by doctors Sarah and Sophie. The huge success of the training week was rounded off with a fantastic campfire meal shared by the Outdoor and Office teams. A great time to be together and strengthen bonds and a fantastic start to what promises to be an exciting 2012 season. We look forward to welcoming you to the woods. Training Week has been very successful this year. We have a great team and I am really enjoying working with them. This entry was posted in The Woodlore Team on March 30, 2012 by Woodlore Team. I really do enjoy your website and material, it is very entertaining however, I was a little concerned after watching some of the material you have on Australia. If I may, I think you need to be a little more careful regarding safety particularly in some of our more remote areas, and as Mr Mears has described, are very remote. My concerns centre on some of our wonderful wild life particularly some of our more slithery friends. There are number of snakes that people who travel though the western desert areas and western Queensland need to be aware of, and may encounter, in particular are the Western Brown and the Western Taipan respectively. If you are bitten by either you are in a lot of trouble, the Western Taipan is the most venomous snake in the world and is three times as venomous as the Coastal Taipan. The Coastal Taipan habitat is the tropical coastal areas from north-western Western Australia, the northern parts of the Northern Territory, across Cape York Peninsula and coastally through eastern Queensland to Grafton (New South Wales). The Coastal Taipan has been responsible for many human deaths. Our Brown Snakes are known for their speed and aggression and will activity pursue you if threaten. So when bush walking throughout our wonderful country please remember that we have lots of lovely wildlife but can have a sting that may end your life and as Mr Mears has highlighted in his DVD and shows the distances travelled to medical help are immense. I am fortunate I have been wandering around our wonderful country for over 30 years now from the our high country at Kosciusko to the Walls of Jerusalem in Tasmania, my next jaunt will be the Bibbulmun Track in Western Australia. Keep up the good work and keep the knowledge alive. Do you offer courses in the US? My family want to learn outdoor first aid and survival.